Quaker Steak & Lube® helps fans kick back with some wings this season. SHARON, PA. – December, 2011 – The award-winning casual-dining concept Quaker Steak & Lube®, is crazy about wings and football! And if you are too, or are just crazy about a great deal on Best Wings USA then pull up to your nearest participating Quaker Steak & Lube® between January 1st and 31st, 2012 to score big! Parobek to design and execute new strategies in planning, inventory and logistics for the growing brand. SHARON, PA. – November 28, 2011 – Quaker Steak & Lube®, the award-winning motorsports-themed casual-dining concept, announces that William (Bill) Parobek has joined the company as Vice President of Supply Chain Management. He is charged with all aspects of inventory control, as well as keeping The Lube®’s supply chain management on track for long-term growth and success. SHARON, PA. – November 1, 2011 – /PRNewswire/ — The award-winning casual-dining franchise Quaker Steak & Lube® known for its Best Wings USA and over 21 sauce varieties, has experienced unprecedented growth in 2011 with the opening of eight new restaurants, and signed franchise agreements to develop more than 35 locations in the U.S. over the next several years. Currently, Quaker Steak & Lube® has 47 locations in 15 states and Canada with plans to open 12 new restaurants next year. SHARON, PA. – October 31, 2011 – The award-winning casual-dining concept Quaker Steak & Lube®, known for its Best Wings USA and over 20 sauce varieties, has recently joined HealthyDiningFinder.com to promote their more nutritious side for customers of all ages. SAN FRANCISCO – October 31, 2011 – /PRNewswire/ — Cheers magazine, the only beverage business publication devoted to full-service restaurants, bars and hotels, announced the winners of its 2012 Cheers Beverage Excellence Awards. The awards will be presented to the winners at the annual Cheers Beverage Conference, held on January 23-25 at the Astor Crowne Plaza in New Orleans. Quaker Steak & Lube® is here to serve, and here to stay. SHARON, PA. – October 31, 2011 – According to The National Chicken Council’s 2011 news release, 13.5 billion wings will be marketed as “chicken wings” this year alone, which translates to over 3 billion pounds. The majority of which are sold to the food service industry. Quaker Steak & Lube®, the Award-Winning casual-dining concept, offers some thoughtful analysis on what they call “Chicken Wing Cult Culture” and why spicy Chicken Wings are not a passing fad, but a decades old passion. Called upon among varying generations and cultures, spanning across multiple continents, chicken wings are a food that groups gather around. SHARON, PA. – October 24, 2011 – The Award-Winning casual-dining concept Quaker Steak & Lube® brings back a Lubie holiday season favorite. From November 1st thru December 25th at any participating Quaker Steak & Lube® a guest can purchase a $25 gift card and receive the choice of a Free Bottle of Award-Winning Sauce or take home a $5 Bonus Gift Card. 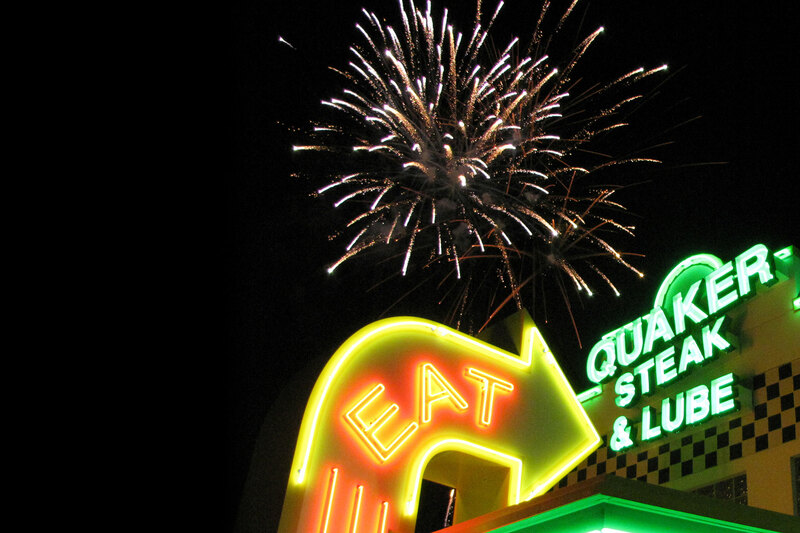 Quaker Steak & Lube® continues its national expansion with a new location in Springfield, IL. limited time to benefit the fight against breast cancer. SHARON, PA. – September 20, 2011 – The Award-Winning casual-dining concept Quaker Steak & Lube® known for its Best Wings USA and over 20 sauce varieties will bring a new prototype restaurant to Springfield, IL will open Wednesday, October 5, 2011 at 3 pm. The restaurant will create close to 200 jobs for the area and will mark the first Quaker Steak & Lube® location in Illinois making The Lube® home in 15 states. The new Lube will be located at 1121 W. Lincolnshire Blvd. Springfield, IL. The Lube® is the first restaurant to open at Legacy Pointe, located directly next to Scheels, a privately held two-story sporting goods superstore. SHARON, PA. – September 20, 2011 – The Award-Winning casual-dining concept Quaker Steak & Lube® introduces new shrimp and salmon menu items, only available this October. This pink hued program is timed to coincide with National Breast Cancer Awareness Month where the mono chromatic seafood can offer a reminder to the public of the steps women can take to save their lives. A portion of the proceeds from each menu item purchased will go to the fight against breast cancer in the local communities surrounding participating Quaker Steak & Lube® restaurants. Quaker Steak & Lube® is now the Official Chicken Wing of the Cleveland Browns! CLEVELAND, OH – September 9, 2011- Quaker Steak & Lube® has partnered with the Cleveland Browns to earn the distinguished title of “Official Chicken Wing of the Cleveland Browns”. As part of their partnership, The Lube® now has co-branded concessions within Cleveland Browns Stadium. Fans can enjoy Lube favorites at the completely re-branded concession stand outside of Section 121 or at the following concession stands throughout the Stadium: Sections 104, 504 and 528. The Stadium will also serve Quaker Steak & Lube’s® BEST WINGS USA within the Luxury Suites!